The goal of this website is to share experiences and lessons learned as a firefighter/paramedic, pilot, and writer. 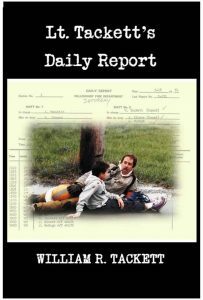 Lt. Tackett’s Daily Report is now available! Click on the image to go direct to barnesandnoble.com. Stan, the President of Galion Air and I planned to fly to Winter Haven, Florida in the company Cessna 182 on Monday June 6, 2016. I offered to plan the flight and had put together a route that would take us from our base at Galion, Ohio to Athens, Georgia for our only fuel stop, and then on to Winter Haven. Sunday June 5th, tropical storm Colin suddenly popped up in the Gulf of Mexico. Hoping it would die out or veer away from Florida, I got up at 4 a.m. Monday morning to get a weather briefing for our proposed 6 a.m. departure. The briefing confirmed Colin was headed for the mid-section of Florida so I let Stan know that today was a no-go but hoped we could try again tomorrow. As predicted, Colin slammed into Tampa on Monday with 40-60 mph winds, taking down trees and power lines. Tuesday morning’s 4 a.m. weather briefing revealed that Colin was now spinning in lots and lots of rain and low IFR ceilings as he continued on his way to the Atlantic. The mid-section of Florida was getting the heaviest rains and flooding. Again, I let Stan know that launching in the 182 would not be a good idea. Since he had obligations to fulfill in the Winter Haven area, he decided to take a commercial flight. I told him if the weather got better by Wednesday, I’d fly the Skylane to Florida and the two of us could fly back over the weekend. But the weather patterns over the Orlando/Tampa area continued to bring heavy downpours and thunderstorms that I didn’t want to try to pick my way through at the end of a 6 hour flight from Ohio. So, I stayed home and Colin entertained Stan until he flew back on an airliner. Unable to accept defeat, we planned another trip to Florida for the first week in October. We met at the Galion airport (KGQQ) at 6 a.m. on Saturday the 1st. I had filed IFR and needed to get my clearance. Usually, I just called Mansfield Clearance on the RCO (Remote Communication Outlet) frequency but I had never tried to get a clearance when the tower at Mansfield was closed for the night. 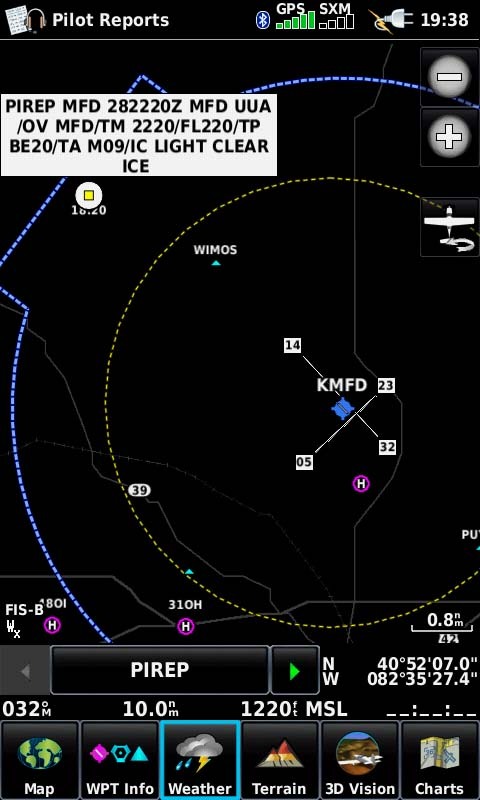 According to the approach plate, when the tower is closed and you want to make an IFR approach into KMFD, you call Cleveland Center. So I figured that would also apply to getting a clearance. I called Cleveland Center on my cellphone while in the plane. Cleveland told me that I needed to contact Mansfield Approach for my clearance. I told them the tower was closed until 7 a.m. They then called Mansfield on the phone and confirmed that they open at 6 a.m. not 7. Embarrassed at my mistake, I quickly thanked Cleveland for their assistance and then tried calling Mansfield on the RCO frequency. I tried the standard approach control frequency. The morning weather briefing had shown that airport weather stations along our route in Ohio, West Virginia, and Kentucky were reporting lMC and low IMC mostly due to fog but I could see stars above Galion, so I figured I’d climb VFR to pattern altitude and get my clearance from Mansfield while airborne. Finally, Mansfield Approach answered and provided my clearance to Athens, Georgia. As the sun came up, Stan and I enjoyed smooth air and clear skies above a deck of fog and broken undercast. As forecast, the fog and broken clouds cleared as we entered southern Kentucky into Tennessee and skies were clear for the rest of the trip. 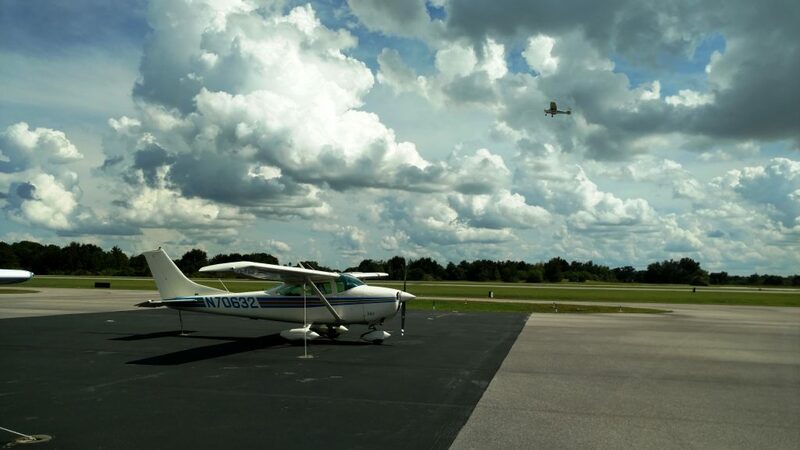 After our fuel stop in Athens, Stan took the left seat and flew VFR with flight following to Crystal River, Florida where he was to meet friends he would be staying with. From Crystal River, I flew solo to Winter Haven under a 4,000 foot ceiling that was growing thunderstorms for the evening. The plan was to spend the week with my son who lives near Winter Haven while Stan spent time with his friends. I would leave early Friday, fly to Crystal River (KGCG) to pick up Stan, and then we’d make our way back to Ohio. Hurricane Matthew, however, had other ideas. By Monday, it was all but assured that this monster was going to create havoc for Florida and points northward. Florida’s governor was so convinced, he had already issued a state of emergency even though Matthew wasn’t expected to reach Florida until Thursday into Friday. I let Stan know that I couldn’t guarantee that we’d be able to get out of Florida in time to have him back to work on Monday next week unless we left Tuesday morning ahead of Matthew’s weather influence. Forecasters were also predicting that Matthew could circle back to Florida after strafing the coasts of Georgia and the Carolinas. I explained that if we stayed past Tuesday, we might have to remain until sometime the following week. At the end of our discussion however, we both agreed to stay and hope that the dire predictions would fizzle out. But by Tuesday night, the forecasts were holding. I checked weather along the route back for a possible return flight on Wednesday. All of Florida from Tampa to Georgia was expected to be IFR, with the rest of the route VFR. The other factor I had to consider was that Winter Haven couldn’t guarantee hangar space for the Skylane when the high winds and heavy rains came. Being a transient, I figured they’d rightfully give priority to the regulars and I’d probably get bumped back out if I ever did get in. I made the decision to cut my stay short by two days and head back. Stan however, told me he had a business appointment scheduled for Wednesday and would take a commercial flight back to Ohio. Around 7:30 Wednesday morning on the ground at Winter Haven, packed, and preflight complete, I tried using the GCO (Ground Communication Outlet) frequency on the field to contact Tampa Approach to get my IFR clearance. The ceiling was about 400-500 feet so I wouldn’t be able to take off without it. As Yogi Berra liked to say, it was déjà vu all over again. There was no answer on the radio after multiple attempts just like in Galion five days earlier. Not having experience with a GCO, I figured it was just another form of an RCO like the one I was familiar with in Galion. I was wrong. I didn’t know it at the time, but a GCO is a radio-to-telephone link. In order to activate it, you have to key the microphone a certain number of times. The clicks activate the link and then you can talk. Since I didn’t make the mic clicks, I never made contact with Tampa Approach. After much research back in Ohio, it finally took a call to Winter Haven to determine that it takes 4 clicks to activate their GCO but it wouldn’t have mattered even if I had known it at the time I needed it. The system had been inoperable for some time. Since I didn’t know the phone number for Tampa Approach, I called up Flight Service on my cellphone. They then gave me the National Clearance Hotline phone number which enabled me to get my clearance and a void time. Soon, I was at 8,000 feet and above the clouds, basking in bright sunshine from clear skies above. I listened to ATC vector civilian aircraft around the many MOAs along my route as they became hot and also heard ATC clearing military aircraft to operate within the MOA boundaries. After crossing the Blue Ridge Mountains, Knoxville Approach’s radar equipment dropped offline and I had to radio altitude and reporting points along my route until I was handed off to Huntington Approach. The controllers shortened my flight time by granting some requests for direct-to shortcuts and by offering some of their own. One of the shortcuts I was surprised to get was offered by Columbus Approach. They cleared me direct from ROHDE intersection to KGQQ. That put me perpendicular to and over the top of the final approach path for the airliners they were controlling, providing dramatic views of landing commercial flights. I had made it back safely but I still needed to keep track of the hurricane and Stan’s progress. Some Florida commercial airports closed on Thursday ahead of Matthew (Orlando closed at 8 p.m.), and I’m sure there were plenty of people vying for the remaining flights out, but Stan managed to get a seat and arrived safely in Columbus Thursday afternoon. Perhaps next year, we’ll plan another trip to the “Sunshine” State. Perhaps we’ll get introduced to another storm by name. Perhaps Winter Haven’s GCO will be repaired and I’ll get to make 4 clicks to connect the Skylane’s radio to Tampa’s telephone. Perhaps, the weather will be so spectacular it won’t matter. I’m just your average 64 year-old instrument-rated pilot who flies an average 47 year-old Cessna out of an average non-towered airport. 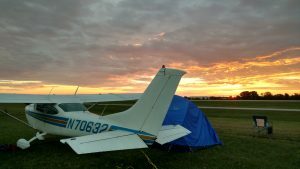 In April 2016, Josh, a VFR pilot half my age, and a member of the group I belong to called Galion Air (based at Gailion airport (KGQQ), asked if I would like to fly with him and his family to Oshkosh for AirVenture. I had only been to AirVenture once. That was in 2012 and I drove from Mansfield through Chicago to get there. The drive was horrible but the time spent at Oshkosh was wonderful. 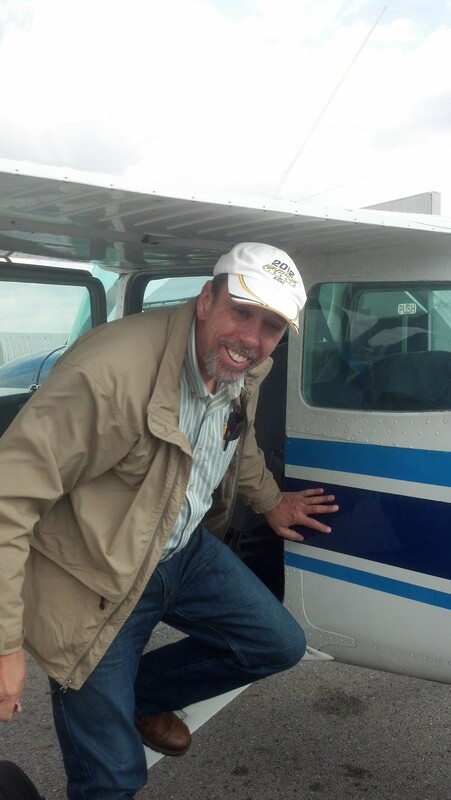 This would be Josh’s fourth year flying to Oshkosh so he was an old pro who knew first-hand how it all worked. He also knew from experience that the weather could be challenging for a VFR pilot flying from Ohio to Wisconsin and back. I’m IFR rated and current so if the ceilings or visibilities became too low for VFR, we could still fly the IFR equipped Cessna 182 to our destination. Friday morning, July 29th, at 6:50 a.m., our camping gear was loaded into the Skylane and Josh’s wife and son (he turned 6 on the 29th) had settled into the back seat. 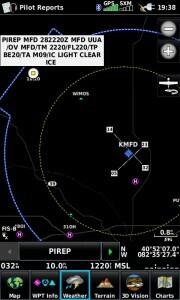 Josh programmed the Garmin 430 and I called Mansfield Clearance to activate my IFR flight plan to Porter County Regional (KVPZ) located in Valparaiso, Indiana for the first leg of the flight. Patches of fog hugged the ground and the visibility was marginal VFR but the ride was like velvet as the verdant farms and fields of northeast Ohio and then northwest Indiana slid underneath us. Just under an hour-and-a-half later, the South Bend controller offered vectors to intercept the localizer for the ILS 27 approach. But I could see the airport clearly so I canceled with him, switched to the CTAF, and landed on the 7,000 ft. runway. It wasn’t until we looked at our cellphones which had automatically adjusted the time back an hour, that we realized we had flown through a time zone. Josh got a weather update prior to the next leg of our trip and found that although Chicago was VFR now, it was forecast to have heavy rains and possible storms within a couple of hours. Oshkosh on the other hand had heavy rains and possible storms now with the forecast to become VFR later in the afternoon. 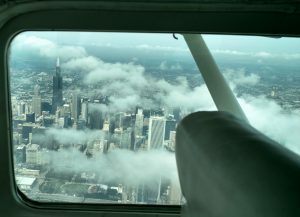 His recommendation was that we continue north to get ahead of the weather coming in to Chicago and then land at Waukegan Regional (KUGN) in Illinois until the weather over OSH cleared. Josh fired up the engine, got Flight Following, and took us to the Lake Michigan shoreline, then followed it north past Chicago while staying under the class Bravo airspace. We made it to KUGN and spent some time at the Signature FBO while we waited for the weather to clear over Oshkosh. In case you were wondering why I just didn’t fly us there IFR, I hadn’t planned on flying the second and final leg of the trip so I hadn’t made the required reservation which had to be filed at least 6 hours in advance. As predicted, the weather over Chicago deteriorated and the weather over Oshkosh improved but now we couldn’t get in to OSH because the airshow had started. So we came up with a new plan. Back in the air, Josh was handed off from Chicago to Milwaukee who vectored us inland for a bit to keep us out of their commercial traffic flight path. The marginal VFR ceiling and a couple of 1,100 ft. agl towers in the area made us glad when we were able to get back over the shoreline. Just south of Sheboygan, we turned west and flew direct to Fond du Loc (KFLD) in ever improving skies. We landed at KFLD which was outside of the Oshkosh TFR and then took the shuttlebus to Airventure where we got our tickets, made sure a camping spot in the Vintage aircraft section was available, and watched the balance of the airshow. After the airshow was over, Josh and I took the shuttle back to Fond du Loc to retrieve the Skylane. We now had less than an hour before the controllers would stop incoming flights at 8 p.m.
“Do you want to fly the plane into Oshkosh?” Josh asked. He didn’t have to ask twice. We took off from KFLD and I pointed the nose toward Ripon. All my lights were on, the transponder was on standby, and we both scanned for other aircraft as we listened to the arrival ATIS. Along with the reminders to stay single file, no S turns, etc., we heard the following. At Ripon, I put the 182 over the railroad tracks and motored on at 1,800 ft. msl and 90 knots toward Fisk, now listening to the Fisk Approach controller giving directions to aircraft ahead of us. I sprouted a smile as big as a kid who just woke up and saw the toys under the Christmas tree. On a left base for 36 and approaching final, I was still 1,000 feet over the ground. The tower hadn’t made contact with me so I radioed a request to descend. I’m still just an average pilot, but now I have bragging rights. The following story is from my Confessions of a Thankful Pilot series. 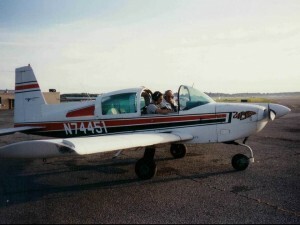 My first attempt taking the IFR (Instrument Flight Rules) flight test was on June 14, 1994. But with only about 15 minutes of flying left, the flight examiner discontinued the test because of bad weather conditions. My second attempt on August 23rd succeeded and I became an FAA certified instrument rated pilot, approved to fly through clouds. Fourteen days later, on Tuesday September 6, I filed my first IFR flight plan as an instrument rated pilot. 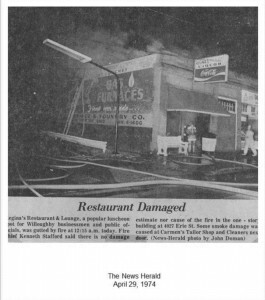 Byron (Fuji) Hasegawa, a fellow Willoughby firefighter, wanted to go to Kalamazoo, Michigan to spend a few days with his wife Faith who was on a work assignment there. Instead of a 4 1/2 hour drive, he opted for a 1hour and 45 minute flight with me. 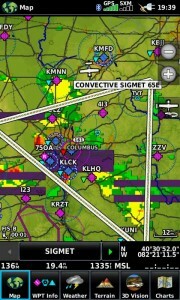 While at home during some passing storms, I checked some of the weather features of my GDL 39 3D. 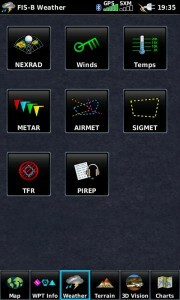 Here is the Weather Products page. I decided to check for pilot reports. On the map page used when navigating, I found a couple of pilot reports which are depicted by a small square. A small green square, I found out, indicates a general pilot report. A yellow square indicates significant information. And although I didn’t find a red square today, it would be reasonable to think it would hold extreme importance. This screen shows one of the pilot reports I found. A yellow square near Mansfield, Ohio indicated a pilot report of interest so I clicked on it and got the on screen report as you see. Although I don’t fly at the airline altitude, the report is still significant because with 89 degree temps on the ground, it indicates the extent of the precipitation/atmosphere instability. 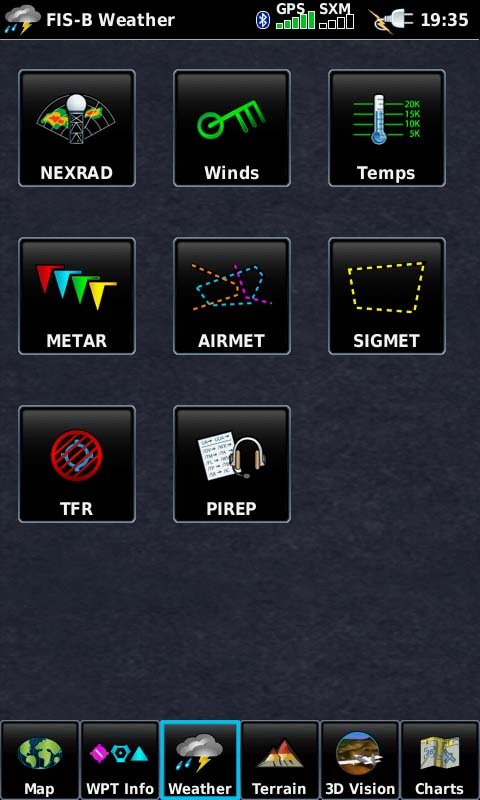 Other items I that popped up on the navigation map screen were Airmets and Sigmets. You can toggle these on or off. Initially, you will see a yellow dotted triangle or other defining figure. Click on the dotted line to get the Sigmet information. That’s all for now. I’ll report more as I gain more experience. 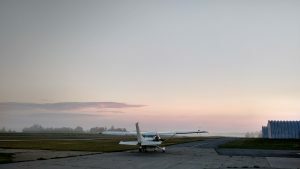 The first light of dawn was filling the eastern sky when the Skyhawk’s engine came to life. It was 7:10 on October 9, 2013 and I was about to begin a journey that would be as epic for me as the flight across the Atlantic had been for Lindbergh. Who could have known that wanting to tear down years of animosity that my dad and I had for each other 25 years ago, would lead to the two of us taking flying lessons together, attaining our pilot license, and eventually to this moment. Cancer had taken my dad in 2001, so today I’d be wearing his David Clark headset on the trip as a way of bringing him along with me. The following is from my memoir Someone’s Hero. The first time I remember someone saving my life was Monday, September 1, 1975, one month after starting as a career firefighter. Ohio had been getting more than its fair share of rain for days and the swollen rivers and streams had lured people to “ride the rapids”. The result was plenty of newspaper pictures and TV news video footage showing overturned kayaks, canoes, and rafts in raging waters where people had lost their lives. 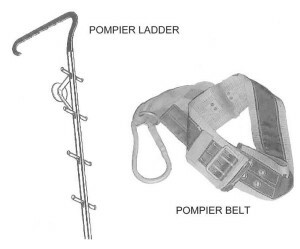 In yet another exercise of how to control fear and develop confidence while using outdated firefighting and rescue equipment, our instructors sent us up to the third floor of the training tower with something called a Pompier ladder. Firefighters are trained to stick a Pompier ladder out of a window, hook it onto the window sill on the floor above, then climb up on the outside of the building or to put it on the window sill on the floor you’re on and climb down to the floors below. December 4, 199 5, a little over a year since earning our instrument rating, my dad and I found ourselves flying in dark clouds in our club’s Grumman Tiger. We had departed Cleveland Cuyahoga County airport in Ohio and were now en route to Dunkirk in upstate New York where we would make a brief stop then fly on to Jamestown, New York for lunch. I was the pilot-in-command for the flight but with only 11 hours of actual instrument time, it was comforting to have another instrument rated pilot with me, even if he was also low-time. 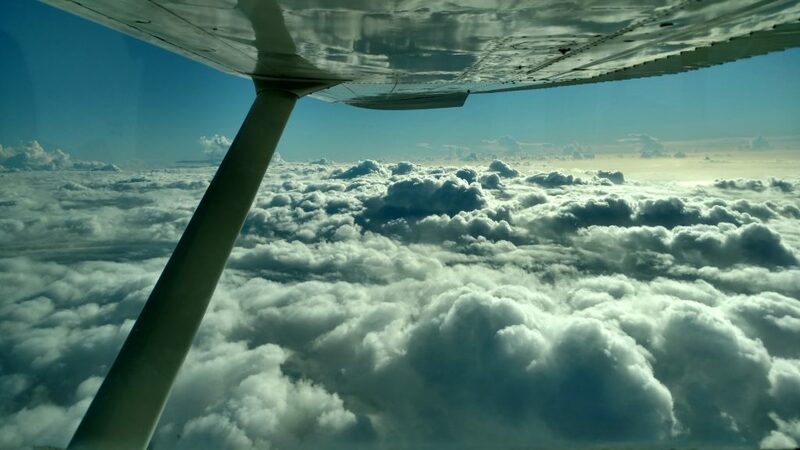 The forecast was for widespread cloud layers and predominately IFR conditions along our route. Icing hadn’t been mentioned in the preflight briefing I received within 20 minutes of our departure but for some reason, my dad commented that he’d like to experience aircraft icing sometime. Well, okay, I thought, as long as it’s not this time on this flight. Before getting out of his cruiser, the officer thumbed the red button on the microphone.